But now researchers have released parasitoid wasps as a natural control and alternative to pesticides at three test sites across the state through a project of the New York State Integrated Pest Management (NYS IPM) program at Cornell's College of Agriculture and Life Sciences (CALS), working with Cornell Cooperative Extension (CCE). "It's not a fast process, but it has the advantage in that if those wasps get established in New York, then we have continuing control that doesn't require any pesticides," said Lamb. 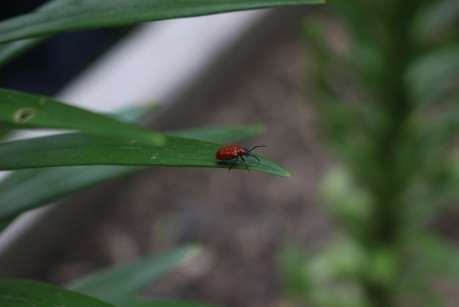 If the wasps do establish themselves, lily leaf beetle levels could decline enough for lilies to thrive. The wasps have been released at CCE sites in Putnam and Albany counties, and at Cornell's Long Island Horticultural Research and Extension Center. An additional release will take place at the Erie County CCE. Before releasing the wasps, the researchers collected beetle larvae at those sites to check whether wasps that had been released and established in other states may have moved into New York and already parasitized the beetle larvae. Eshenaur and Lamb received a three-year, $60,000 grant from CALS in 2016 to release the parasitoid wasps and gather information on whether the wasps will establish themselves in the state. They will also do outreach about the project and create a fact sheet on the wasps. "The project is an important interaction between IPM on campus working with counties and having that move out to the general population," Lamb said. "It's a way of getting the word out about the concepts of integrated pest management, so that people realize there are alternatives in some cases."